Theoretically, Could Tesla Survive Another Recession? With fears of the US markets heading into correction territory, and possibly continuing a downward trend, the automotive industry will not be immune to any fluctuation or volatility in the stock market. One particular sector of the automotive industry, the luxury car market, could see some tough times in the United States, as China’s demand for luxury vehicles has waned, which could have an impact on the local economy should this downturn continue. Tesla is still a relatively young company, an automaker that is still losing money and is trying to raise another $500 million to open a factory that will manufacture the Model 3. Tesla’s fate, like many companies across all industries, is tied directly to our economy. Should there be no delays, the Model 3 will be available by 2017. With a two year buffer from now until then, a lot can happen. Seeing as though Tesla does not have a car priced below $40,000, any blip in the stock market could have dire consequences for the electric car manufacturer. With the BMW i3, Mercedes Benz B Class, Chevy Spark, Chevy Volt, Ford Focus Electric, and Volkswagen e-Golf to name a few, other car companies are already in a position to survive any turbulence in the markets. Tesla on the other hand, is not. While Tesla can boast that their cars get better range, they can’t be prideful of their price tags. Consumers will compromise and sacrifice range for price. That’s the way it is now, and in a rough economy, that’s the way it will be then. 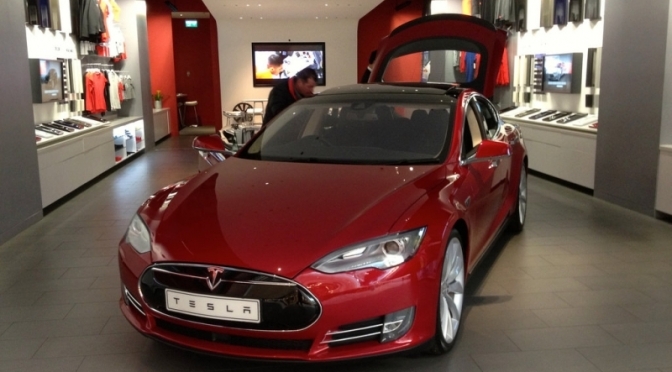 Tesla is selling cool, but not practicality. Their fan base consists of window shoppers who daydream about owning the electric car, but when push comes to shove, only a small minority will tighten the belt and purchase the Model S, and in a few months the Model X. Oil prices have now hit a 7 year low, and currently the price is hovering around or below $40 a barrel. Not a good sign for any electric car brand or model, and it’s no coincidence that car manufacturers are now advertising performance over being energy efficient. The future isn’t certain however, and any adversity our economy faces is always something to watch. The automotive industry will inevitably be part of the highs and lows, and it’s during the dark times that we learn which companies can and will survive , and the ones that we’ll look back on thinking about the what ifs. Tesla may be one of those companies that’s not strong enough to survive, especially if their Model 3 does not hit the market while the economy is still strong. After the recession in 2008, the luxury brands learned from their mistakes. They added cheaper cars to their lineups to sustain themselves during adverse times. These powerhouse manufacturers are in a position to survive.The smaller car brands may be on life support for a while should we dip back into a recession, or face volatility for a period of 6-12 months. Previous Previous post: Is It Possible To Sell Cars On Instagram?